One of the best parts of my job is meeting some of Hope’s 33,000 alumni on their home turf. With graduates living in all 50 states and over 80 countries around the world, the opportunities for connections are endless. Whether it’s entrepreneurs from Nairobi, newly found connections in Tokyo or young alumni making their mark in Chicago, it is inspiring to meet alumni as they pursue lives of leadership and service in a global society. This exciting professional privilege reached new heights during a trip last fall to California and Washington State. 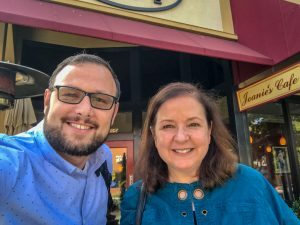 In part because of a new partnership between the office of Alumni Engagement and the new Boerigter Center for Calling and Career, my goal was to establish connections with alumni in technology to share with current students on campus. We have over 1,750 alumni living in states with Pacific shores. As you might expect, a fair number, over 600 in fact, live in the San Francisco and Seattle areas. Many of them, also as you might expect, work in the tech industry. This was the focus of my trip. I had a great visit with Eva at Joanie’s Cafe. Her story of creating community within her field is inspiring. After Lyft rides during the first 24 hours in the Bay Area in two Lexuses, a Mercedes and a BMW, I knew I was not in Holland, Michigan anymore. 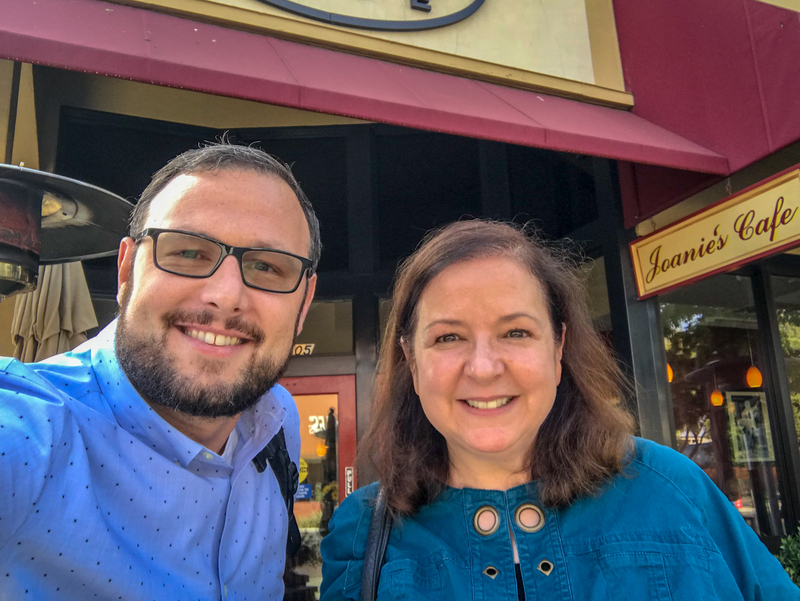 My first appointment was in downtown Palo Alto with Eva Gaumond ’90. She has had an accomplished career as a user experience (UX) leader, often fostering collaboration and utilizing empathy she learned as a psychology major at Hope to get to the heart of user needs. After moving to the area and wishing there were more professional development opportunities in her field, she simply created them herself, co-founding a now 2,400 member non-profit professional UX organization from the ground up. It was an impressive start to my day. Part of Facebook’s new headquarters, MPK21. After breakfast, I made the short six mile trip out to Facebook’s new headquarters, MPK20. 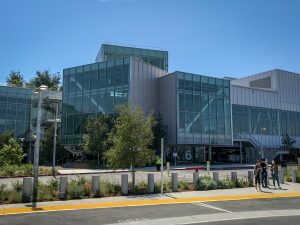 Designed by world-famous architect Frank Gehry, the 430,000-square-foot space, spread over 22 acres, is LEED-certified and boasts a 9-acre green roof (complete with work cabanas) and underground parking lot. While entering this compound of an office building was a unique experience, what made it even more meaningful was connecting with a friend now working inside. I first met David Moore ’10 when he was an intern in the alumni office. From there he joined the Canadian digital marketing and e-commerce team at Gordon Food Service in Grand Rapids before moving to Philadelphia to work at a start-up using machine learning to personalize websites and apps. Now David counts himself fortunate to live in San Francisco where he works in product management on video products at Facebook. We were joined for lunch by another Hope alumnus, Josh Metzler ’99, who has been a software engineer at Facebook for the last seven years. A chemistry and religion major while at Hope, Josh is a self-taught coder who has now been working for the world’s largest social media company for longer than most of its 25,000 employees. Facebook employees and Hope College alumni, David Moore ’10 and Josh Metzler ’99, take a break to talk about their Hope College experiences. The Indian cuisine at Facebook is legit. Over naan and tandoori chicken we discussed how a liberal arts background has shaped how they solve problems at work. They shared that Hope gave them the freedom and supportive community to be curious. Then David told me this story: A friend of his visited during a semester off at Harvard and attended a class at Hope with him. Afterwards the friend remarked, “that was a better class than I’ve experienced yet in Cambridge – intimate, thoughtful, engaging.” At the time, David wasn’t sure he believed him. Now, after applying his Hope experience in Menlo Park, he thinks he does. 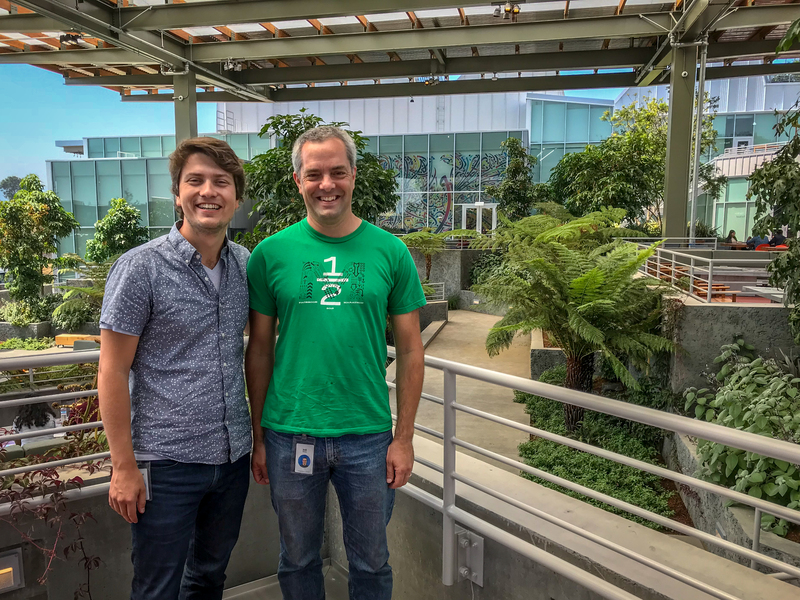 Influenced by courses like creative writing and religion, these Facebook staffers talked about technology as being about understanding the deeper needs people have – some they can share, some that they can’t. Their work is focused on bringing the world closer together and understanding people’s perspectives. This way of thinking not only makes for a better interface on an app, but also helps to figure out how machine learning can help identify bad actors. After an evening enjoying some of the sights in San Francisco, I spent the next day connecting with alumni at Google and Tesla. At the Googleplex in Mountain View, a gathering of Hope alumni Googlers met over breakfast. In a testament to the longevity and relevancy of a liberal arts background, we had graduates from each of the last five consecutive decades represented. Crossing the commencement stage back in Holland with dates ranging from 1979 to 2018, these product directors, software engineers and recruiting coordinators compared notes on what can help a graduate of this decade stand out. The consensus was that students should articulate the soft skills they have developed through a liberal arts education — skills like teamwork, problem solving and communication — alongside demonstrated hard skills developed through experiences like coding competitions, proficiency in programming and scripting languages. 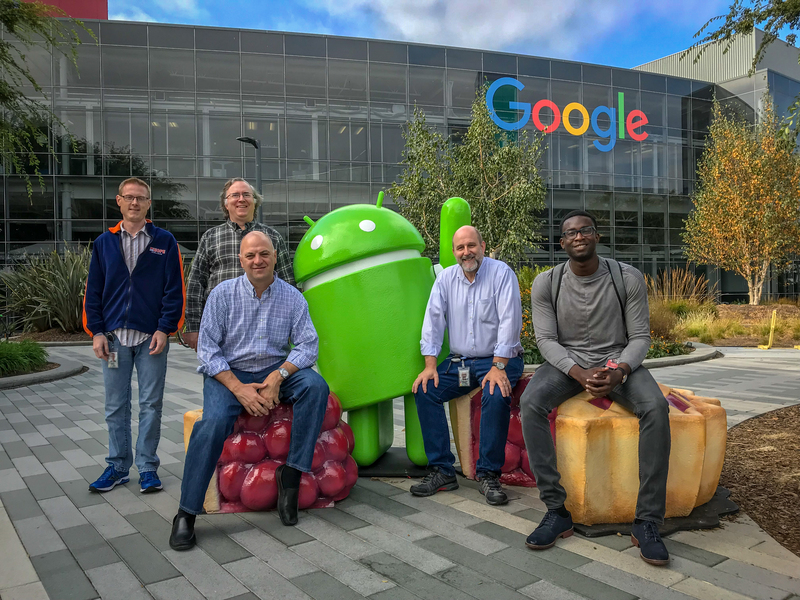 Karl Rasche ’00 (Senior Software Engineer), Ron Heiby ’79 (Technical Program Manager), Chris Turkstra ’93 (Product Director for Google Assistant), Douglas Van Wieren ’88 (Software and Site Reliability Engineer), and Josias Sanon ’18 (Recruiting Coordinator). Later in the day, at a new Tesla office building in North Bay, you could sense the fast pace of innovation. There I connected with Blair Williams ’10 and Randy Johnson ’07. 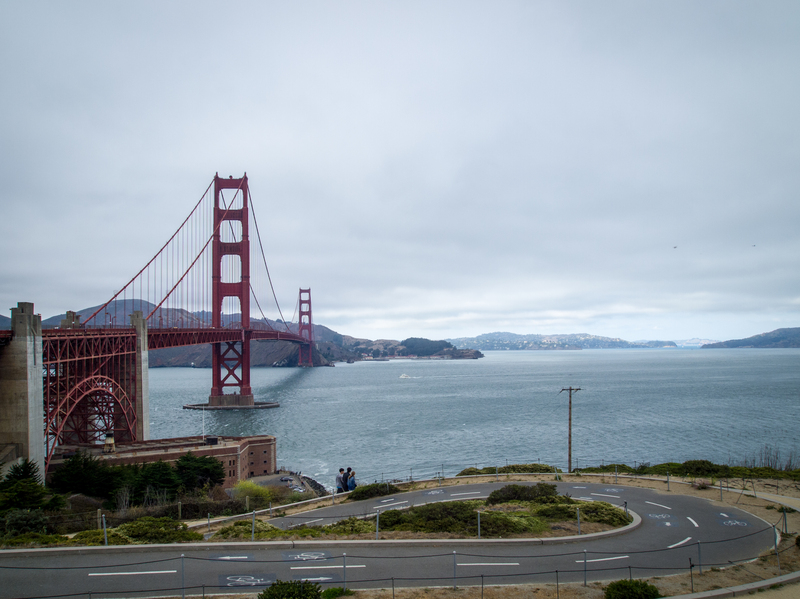 They shared how the undergraduate research program and international exchange programs sparked their interest in language and culture and opened the door for graduate experiences at places like Stanford, which in turn opened doors in Silicon Valley. They also shared how a liberal arts background has helped them to be well-rounded and not just technical. Through experiences at Hope they were able to wrestle with philosophical, societal, and spiritual questions, improve writing and communication skills, and becoming well prepared for working on cross-functional teams. The icing on the cake was the personal relationships with research advisors and senior seminar professors that turned into personal friendships which have shaped their lives in immeasurable ways. 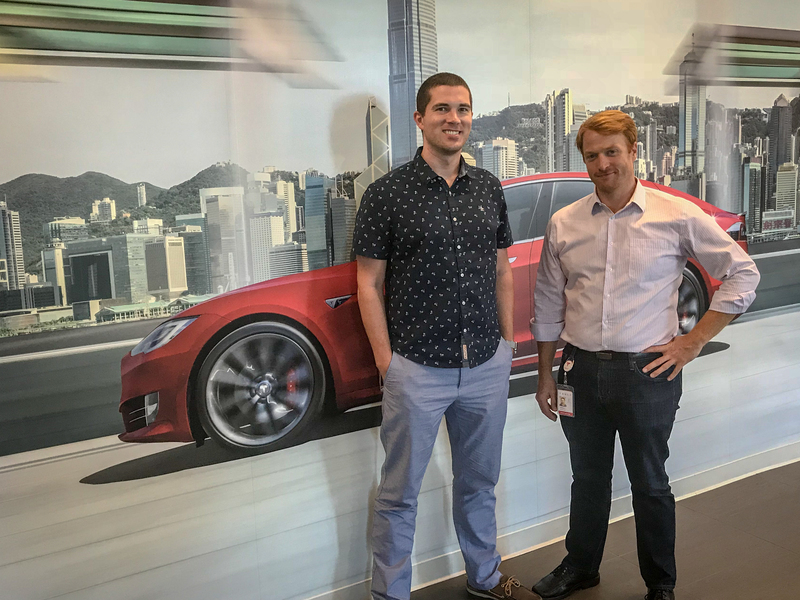 Blair Williams ’10 and Randy Johnson ’07 at Tesla. After two hours in flight over the peaks of Mt. St Helens, Mt. Adams and Mt. Rainier, I landed in Seattle. Among other alumni and employer connections, I met Thao Le ’11. Today she is a senior financial analyst at Amazon. Just a few years ago she was an international student at Hope College from Vietnam. While at Hope she majored in accounting and had internships at The Stow Company and Perrigo. Her first job after Hope was with Deloitte in Seattle working on an audit team. Traveling frequently while working with international teams at Amazon, she now uses leadership development and cross-cultural skills honed at Hope as a member of Mortar Board, Phelps Scholars and Hope Asian Perspective Association. We toured a new Amazon Go store and The Spheres, Amazon’s innovative downtown hub that brings a direct link to nature to Amazon employees. With her office right down the street, Thao shared that she enjoys working and visiting this unique home to more than 40,000 plants from the cloud forest regions of over 30 countries. 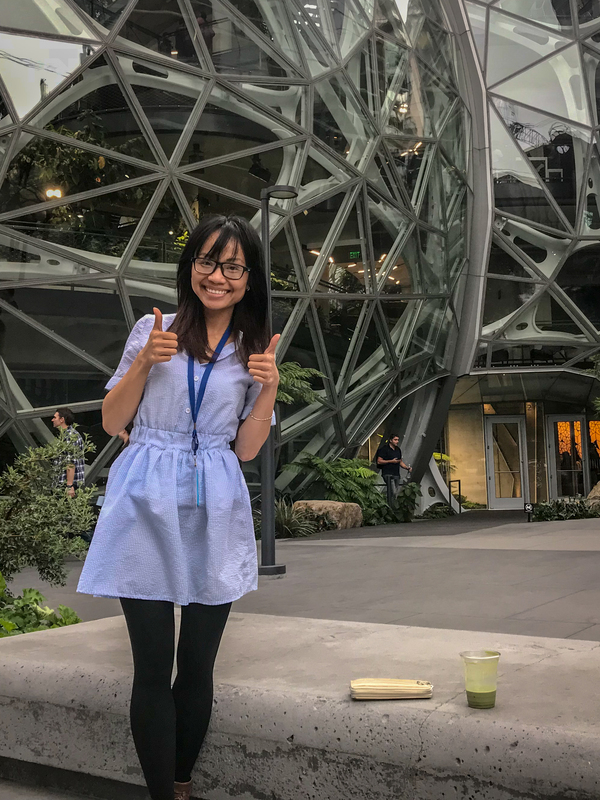 Thao Le ’11 shows off The Spheres at Amazon in downtown Seattle. Once I was back on campus the next week, it was time to share lessons learned from these alumni with colleagues and students. Their stories can serve both as inspiration for future generations of Hope College students and for other alumni to get involved. If you are interested in sharing your own career expertise, hosting a student or hiring a Hope graduate, complete the form at hope.edu/impact and a member of our team will be in touch with next steps. Next Next post: The Invitation of Dr. Martin Luther King Jr.